This is going to be one of the tougher days to ride – quite long, it will likely be hot, and there is a continuous uphill towards the end. You may not like that day but it will be worth the effort: a nice scenery, a unique combination of Atlantic atmosphere and that southern feeling. On the horizon, the Pyrenees are waiting. At the start, by the Dordogne river, we are just slightly above sea level and will climb up to 500 m, with a bit of up and down, as is to be expected on a tour like this one. The route leaves Bordeaux to the west, we won’t be seeing any of it in favor of a lot of country side, fields and forests as we head south, reaching the Garonne river valley about 35 km into the ride. Time for beakfast or coffee. We will stay in the river valley for quite some time, leaving the valley about 90 km into the ride. Now the route gradually climbs up to 200 m above sea level, crossing several smaller river valleys with the usual up and down. Nothing but small towns en route, so I recommend to look for a rest stop at Dému, about 150 km into the day. The afternoon continues the morning’s pattern until we cross the Arros river at 130 m above sea level. 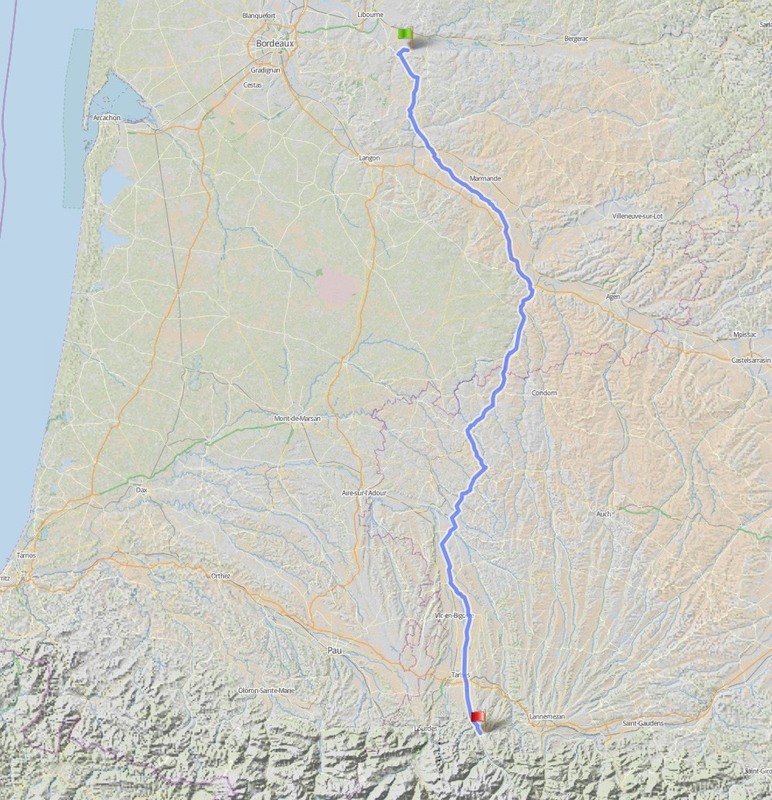 From now on, the remaining 70 km will take us gradually but steadily up the foothills of the Pyrenees. Tarbes, 225 km into the ride is worth a final refreshment stop. All supplies should be available there as well as restaurants and bars for any taste. Camping ist just north of Bagneres de Bigorre – the town itself is only 2-3 km away and should offer several choices for dinner.